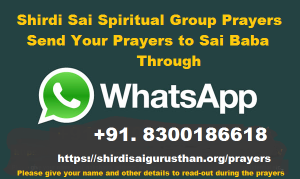 Your prayers to SHIRDI SAI BABA : Prayer List for Shirdi Sai Spiritual Group Prayers on Thursday after Dhoop Aarati – 18:30 hrs on 13th October 2016. Prayer List for Shirdi Sai Spiritual Group Prayers on Thursday after Dhoop Aarati – 18:30 hrs on 13th October 2016. When our prayers from all parts of the world focusing on a specific day & specific time (on Thursdays at 18:30 hrs after Dhoop Aarati) with a single object and total concentration on praying for others, with our noble intention of getting help from Shri Sai Baba for those known and unknown to us, praying selflessly for the benefit of all global Sai families, certainly this divine vibrations from all participating devotees all over the world energize and elevate our subconscious mind with powerful spiritual vibrations, that our group prayers shall have the capability to release divine guidance, divine protection, averts disaster, very powerful divine impact and more importantly all participants witness powerful answers to our prayers. Let us sincerely pray for all devotees and request Shirdi Sai Baba to accomplish all their desires as soon as possible. 1. My daughter Suganya should get good groom. Please fix and arrange marrage soon. 2. My children Sri Nandhini, Sahana, need full mental strength, sound health, good eduation, Baba please be with us and bless us. 3. Smt Manickam, Sairam, please give good job to my younger son. Om Sainathaya Namah. S. N. Palayam. 4. Shri. R. Shanmugam, Smt. S. Saraswathi praying to Sai Baba to get their son's marriage soon. S. N. Palayam, Coimbatore. 5. Shri R. Subramaniyan. Prays to Baba for His help to succeed his court case and get back all his lost items. 6. Sairam, My prayers to my husband's high blood pressure, diabetic, eye problem, pains need to be healed. His problems with his relations to be resolved. My health problem right from head to foot, head, neck pain, spinal cord pain, back pain, pain in hands, legs, need to be cured with Baba's blessings. My son discontinued his education in middle. He needs permanent job, his mind confusion to be removed, his mental strength to be increased and he should get good life. All we Need Your blessings and grace. Please help Baba. 7. Sairam, please bless us for having a own house for our family. Our son should have good health, good thoughts, good education. All our family members should get good health, all wealth, happy life, life without worries, troubles and turbulances. Family head requires good thoughts, business with good income, development, prosperity. All people from near and dear should get good life, happy life, trouble free life, good health and peace. Shirdi Sai Gurusthan Trust members should get health, wealth, peace and prosperity. 8. Sairam, Please bless our son Deepan Chakravarthy and daughter in law Sountharyavalli to get a child soon. Help our son to pass his C.A., examination successfully. Your mercy to all our family members for good health. 9. Smt. V. Latha Rani, Sairam, Please bless all our family members for good health and happy life. Our business to go good without any financial problem. Please bless our daughters to get good grooms and help to buy own house. Please relocate our family to our native place. Ancestor's property should fetch good price, son should get good education and good job. All should have good life and Baba please extend your help to complete Sai Mandir construction. Sai baba, Please give your all blessings to us to have a child. Sai g please help me . Sai g please give me confidence to face any difficulty in my life. Sai g please please please remove my fear of mind. And keep my mind stable and remove all negative thoughts from mind. PLEASE PRAY FOR MY FAMILY. PLEASE PRAY TO SAVE THE FAMILY LIFE. PLEASE GIVE THE CHILDREN CORRECT GUIDANCE AND OUT OF OF TOUGH TIME. Please pray for my health..baba please cure me baba..please help me out of this..thank you baba..